Last edited by Leander; 15.06.2016 at 22:50. 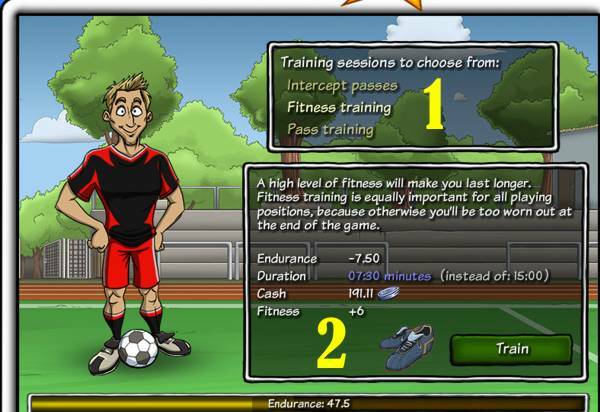 SoccerStar is an installation-free browser game and free to play. It does not contain advertisements. It is funded by Stars (our in-game currency). By buying Stars, you support us and you can be use them to level faster and get unique items. Read the following manual carefully in order to know all the basics and further details. Last edited by Leander; 15.06.2016 at 22:44. Enter your name. Please note that it must be fictional and no longer than 15 characters. The names of real soccer players are forbidden! Enter your valid email address. The validation email will be emailed to this address. For email confirmation you are awarded 10 free Stars as a gift. The smiley indicated how safe your password is. Use this link to log in to your account if you already have one. Almost there...click and join the fun! Our virtual currency (Cash) and premium currency (Stars) are displayed here. You can earn Cash by working, whereas Stars can be bought. You start the game with 10 Cash and 15 Stars. After having confirmed your email address, you get another 10 Stars. This is your in-game appearance. Double-click on it to change it at any time. Your current skills are displayed here. They are affected by your position, training, nutrition and clothing. This is what you are wearing. You can buy clothes in the clothing shop or for quests (work). You can wear one piece of each category at the same time, e.g. only one lucky charm at the same time. You can store pieces of clothing, potions and nutrition in your locker that offers up to four slots. Enter the date of birth and the nationality of your soccer star. It is not required though. Choose your position. Want to be a striker? Want to be a goalkeeper? You can also change the position at any time and train the respective skills. Describe your character. Keep in mind that your description must not contain vulgar, racist, or sexist language. Only English is allowed! Stars. You can buy Stars there. This bar shows your current Fame level. It can be increased by winning games with your club, being better than your opponent or certain quests (work). The higher your Fame level is, the better the clothing and nutrition in the shops becomes. Your active potions. Some potions increase your skills, whereas others reduce the working or training times. Potions can be consumed by drag & drop...simply drag and drop the potion on to your character. Open your locker to directly compare active and stored pieces of clothing. Your locker offers up to four slots to store clothing and nutrition. Last edited by Leander; 15.06.2016 at 22:45. 1., 2. Every 10 hours, new drinks are offered to you in shop. Note: some items cost Stars. You can also spend Stars to get new items more than once per 10 hours. Drag and drop items on to your alter-ego to consume them. 3. Your active drinks are displayed in the top right corner. You can also increase your attributes one by one by clicking on the "+" next to an attribute. Your locker has to be closed for doing so. Click on the locker to open it and display stored items. Training rewards (clothes, lucky charms etc.) will be automatically stored in your locker. Last edited by Leander; 13.11.2014 at 15:33. Last edited by Leander; 15.06.2016 at 22:43. Pick your club name. No vulgar, racist or sexist names and NO real names! Only fictional ones. Want to join an existing club? Accept an advertised job or send a message to the captain of the club you would like to play in. Important: if you leave a club and join a new one, your fame will be locked for 24 hours. Use the tabs to look for a club (clubs, leagues...). Enter the name or rank you want to search for. After entering the name click on search. Captains and honorary members can click on + to invite other players and advertise jobs. After clicking on +, enter the player's name you want to invite or enter the skill level you are looking for. Select the skill level and position, e.g. level 20 and midfielder if you are looking for a midfielder skilled 20 or higher. Job advertisements can be removed by clicking on -. Honorary members and the captain have the right to do so. Each rank can remove players with a lower rank. To leave the club you must click on your name in the member list and remove yourself. Example of a job advertisement. After selecting a player and clicking on - your decision to remove this player must be confirmed. Double-click on a player to view his/her profile. The star symbol can be used to promote other members. A club is limited to one captain. Last edited by Leander; 15.06.2016 at 22:46. Your club description. No vulgar, racist or sexist language! Your coach. The coach can be upgraded to reduce the training costs (-1% per level). The first 25 levels are Cash-only, the next 25 levels also cost Stars. Higher levels add new tactical features to the game. This is the scoreboard. It shows upcoming games. Click on it to view the last 5 games of your club. Your club's members. The members are displayed in the following order: captain, honorary members, full members, novices. The colors indicate the position: yellow = goalkeeper, blue = defender, green = midfielder, red = striker, grey = invited players or advertised jobs. Your club's tactics can be selected by the captain and honorary members. Club chat. Enter your message and press enter to send it. You can also donate Cash and Stars: /cash (amount) or /stars (amount). For exampe: /cash 50. Your club's messages are displayed here (also upcoming games). Expand the chat to view older messages. Your jersey. It can be edited by the captain and honorary members. The manager. Upgrade the manager to increase the earnings for working (+2% per level). The first 25 levels are Cash-only, the next 25 levels also cost Stars. Your stadium. Upgrade your stadium to increase your home advantage (+1% per level). The first 25 levels are Cash-only, the next 25 levels also cost Stars. Your club's stored Cash and Stars. They can be used to buy upgrades. Your upcoming game. Games are set automatically according to skill levels. Therefore, you cannot pick your opponent manually. Every day, between 3 and 4 games take place. Use the + to invite other players or advertise jobs. Use the - to remove players or job advertisements. Use the star symbol to promote other players. Click to send private messages (PMs). Use the color chart to select the brightness level. Click ok to finalize your jersey. Select your line-up. Drag and drop players on to the different positions. In case your club does not have enough "real" players preset non-human players are used. 1. Choose one of three training units. 2. Duration of the training, attribute and cash bonus and possible rewards (items) will be displayed here. This is your endurance bar. Training reduces your endurance. Every hour it automatically regenerates by 4,17 if your character rests and doesn't work or train. The duration of your training. In brackets: the duration under normal conditions and next to it the effect of active potions. Click to begin your selected training. Last edited by Leander; 15.06.2016 at 22:47.